Bang & Olufsen releases BeoSound 5 Encore music system | What Hi-Fi? We've already tested Bang & Olufsen's £3500 BeoSound 5 music system, and now comes a new more affordable version in the form of the BeoSound 5 Encore. At £2900 it undercuts its bigger brother by £600, and does without the pricier model's 500GB hard disk. Instead, it connects directly to your digital music collection on any USB drive, NAS drive, wireless handheld device, external hard disk or computer. It also connects – wired or wirelessly – to more than 13,000 internet radio stations. There are ethernet, two USB, line in and mini jack sockets, as well as UPnP and Bluetooth compatibility. You can connect up to eight BeoSound 5 Encores to the same server to create a multiroom system. Each 5 Encore then just connects to a pair of stereo speakers. Acting as a 'sound hub', the 5 Encore allows you to access your digital music collection by album, artist, track or your list of favourites. 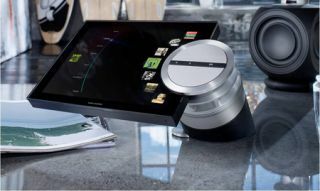 Designed by Anders Hermansen, the unit has a 10.4in LCD screen and a control wheel for selecting the menus. Mounting options include a floor stand (£400), table stand (£170) or wall bracket (£75).